This visual stimulation comes from Bauhaus edited by Magdalena Droste and published by the enfant terrible of the book world, Taschen. Bauhaus is one of a number of Taschen titles reissued at low prices to celebrate the publishers 25th anniversary. 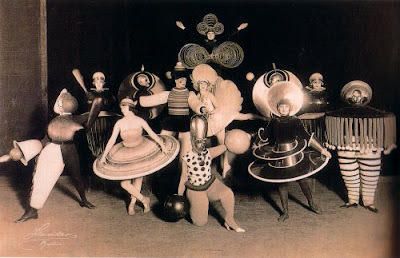 The photo shows costumes for Triadic Ballet designed by Oskar Schlemmer for the Wieder Metropol review at the Berlin Metropole theatre, 1926. I cannot recommend Bauhaus highly enough, and will be returning to it in the coming weeks. Now read about a jazz influenced opera that opened in Berlin in 1927. Interesting that as retailers crash faster than opera houses Taschen have followed Harmonia Mundi by opening their own stores.